Cargo Control Load Binders, Cargo Control Straps & Restraints, Ratchet Cambuckle Tie Downs and Flatbed Winches at Global Industrial. Cargo Control Winch and Ratchet Tie Down Strap Assemblies are used for applications including Distribution, Storage, Commercial, and more. Cargo Control Winch and Ratchet Tie Down Strap Assemblies are made of high quality materials for long lasting durability and dependability. Assemblies provide cargo stability and support for handling and transport security. Spring loaded ratchet buckle allows efficient tensioning and one-handed release for operation ease. Meets military and commercial specifications. Ultimate load limits range from 900 to 40,000 lbs. Working load limits range from 400 to 13,333 lbs. Meets D.O.T., C.H.P., and C.U.S.A. requirements. Dimensions vary per model. Cargo Control Web Winches are used for Securing Loads on Flatbed Trucks, Trailers and other Transport Vehicles. Cargo Control Web Winches are made of high strength steel with black powder coated finish for long lasting durability and dependability. Webbing Winches provide secure shipping and transport of loads for various vehicle applications including Flatbed Trailers, Trucks and more. 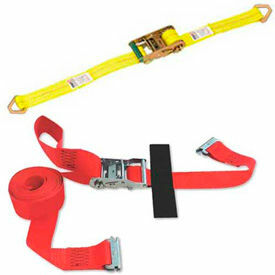 Accepts webbing up to 4" in width. Meets DOT, WSTDA-T3 and Canadian Standard 905. Available Dimensions and Load Limit Capacities vary. Ratchet Cargo Control Load Binders are made to Secure Loads in Chain Binding Applications on Flatbed Trucks, Rail Cars or as Cargo Holds in the Marine Industry. 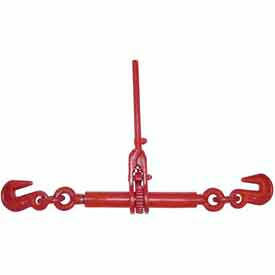 Ratchet Cargo Control Load Binders are made of pure alloy steel for maximum strength and durability. 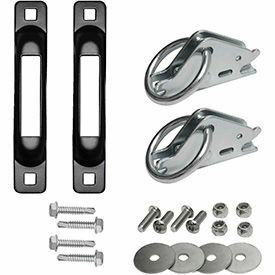 Handle has self-locking one-way bolts for easy removal of unwanted debris. 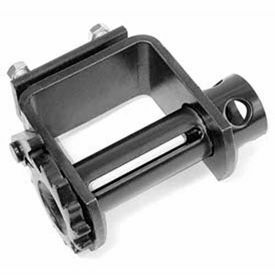 Gears are permanently welded to the barrel for superior ratchet load binder performance. Ratchet cargo load binders are proof tested to 50 percent of the minimum breaking strength for greater reliability. Excellent for operation with dock trucks. Ultimate load limit capacities are 16,200, 27,600 and 39,000 lbs. Working load limits are 5400, 9200, 12,000 and 13,000 lbs. Dimensions vary per style. Snap-Loc™ Cargo Control System Kits are used for applications including Construction, Industrial, Transportation, and more. Snap-Loc™ Cargo Control System Kits are made of high quality materials for long lasting durability and dependability. Kits offer anchoring options for securing and transporting heavy duty material and equipment. Powder coat finish provides corrosion resistance. Available types include Cart Strap Anchor Kit, Dolly Strap Anchor Kit, Hang-It Kit, Ladder Safety Strap Pack, Pro-Pack, Ratchet Pack, Safety/Earthquake Pack, and more. Ultimate load limits are 3000 and 4400 lbs. Working load limits are 1000 and 1467 lbs. Dimensions vary per model. Corner Edge Guard Protectors are used with Cargo Control Load Binder Straps to Reduce Damage during Transport. 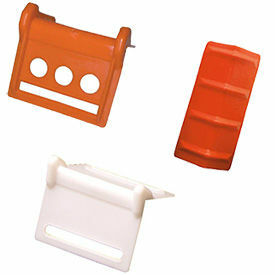 Corner Edge Guard Protectors for Cargo Control Load Binders and truck mounted pallets are made of nylon, polyethylene, plastic or steel for long lasting durability and dependability. Corner Edge Guards prevent straps from cutting into the pallet contents protecting from damage. Slots located along the length of the edge protector hold the straps in place, preventing any slipping or unwanted movement of the strap during transport. Steel Corner Edge Guards are designed for chain and cargo straps and can be used on crates for increased sturdiness. VeeBoards® are an edge protection solution to prevent cargo damage that can result from using tie down straps to secure pallets. BrickGuards® are designed specifically to work with pallet mounted bricks. Available package quantities are 1, 10, 20 and 100. Available sizes vary.